Residents strive to maintain Thornden and Westminster parks as vital green spaces for SU's neighboring communities. With her infant daughter in tow, Miranda Hine would walk the few blocks from her home on Maryland Avenue to Thornden Park in the early 1980s. "It was after four or five months that I was talking to a friend and she said, 'You don't go into the park alone do you?' " Hine said. "And those are a lot of the conversations that you would have with people. 'You wouldn't as a female go into that park alone?' they'd say, and I have been, for the past 30 years, and it's absolutely fine. " Hine did some research and felt that the park's bad reputation was unfair. So in 1983, with the help of other local residents, she formed the Thornden Park Association, a group that has played a crucial role in motivating the city to restore park features including the Amphitheater, Field House, Herb Garden and playground. Less than a mile away, Norm Richards has worked to preserve the view at Westminster Park for more than 30 years. The 4.784 acre park sits at the end of Westminster Avenue atop a 655-foot drumlin. Each year Richards organizes his neighbors to clear out dead branches from the winter and to pick up the beer cans that tend to litter the 181-step staircase the leads to the park from Euclid Avenue. But Hine and Richard are not the first wave of residents to fight for these two local green spaces - they fall into a long legacy of influential Syracusans who have been crucial to the development and maintenance of these sites. The estate of Maj. Alexander H. Davis once occupied the land that residents now know as Thornden Park. He abandoned the property in 1901 to move to Europe and it remained vacant until 1921, with only his gardener maintaining the land. Rather than selling the land to SU, an interested party, the Davis heirs allowed the city to purchase the property for $225,000. "It was a group of very influential Syracuse businessmen who got together and said 'Our city is growing and this is a park ready made, why don't we just take it as a park? This would be great" Hine said. The land for Westminster Park, a former sheep pasture, was deeded over to the city 30 years earlier in 1890, but it did not have any of the markings of a formal park. From 1890 to 1910, the city had done little to improve the property, according to an article published in the Syracuse Journal on Oct. 22, 1910. The only developments were the creation of Westminster Avenue and a sidewalk around the top of the Drumlin. "Superintendent Campbell said to-day (sic) that the people of the seventeenth ward were entitled to have the park improved, as the people of that land pay a large portion of the city's tax, with their residences being very valuable," the article read. In the years that followed, the staircase from Euclid Avenue to Westminster Park was constructed, trees were planted and a gazebo was built to host the families traveling by trolley to enjoy the view. "We have to be grateful that they did plan back then because if you take a look at Syracuse and how big it is and how many large parks it's quite remarkable," Hine said. "I don't think that there are many houses where you can't walk to green space easily." 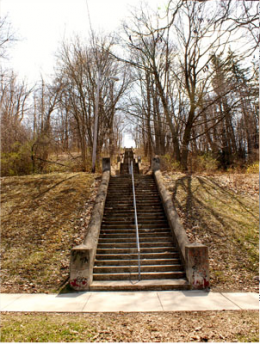 The 181-step stairwell leading up to Westminster Park from Euclid Avenue. Submitted by Annabel Hine (not verified) on October 20, 2009 - 2:51am. Submitted by Lauren Bertolini (not verified) on October 16, 2009 - 2:17pm. I actually think I forgot to pass this along in my rush to graduate last semester. Please! Pass it along to her for me. Submitted by Annabel Hine (not verified) on October 9, 2009 - 11:20pm. Thank you! I was that baby in tow in 1980's (and am now a Newhouse student)and I literally grew up in Thornden Park. It's such a wonderful place. My mother and other tireless volunteers saw that when no one else did. I loved stumbling on this story...which of course my mother didn't tell anyone about, because that's the kind of sneaky, humble do-gooder she is. Thanks again! Submitted by Anonymous on June 3, 2009 - 3:21pm.